When watering kale, the key is to keep the soil evenly moist. 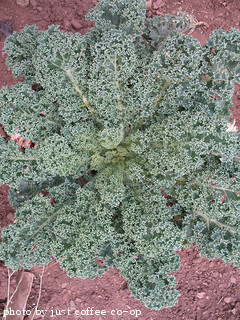 Kale will do well with a single application of balanced fertilizer after the first harvest. If possible, use mulch to keep the soil cool and moist. This will cut down on the amount you have to water. Grass clippings and compost work well as mulch, as do shredded newspapers and stray. If you get a decent rain shower every week or so, your kale crop will likely do fine on its own. If you don't get rain for awhile, you'll need to water the plants yourself. A sprinkler works well for larger patches and only needs to run 10-15 minutes to get the soil moist enough. For just a few plants, use a light spray from a hose or water with a jug or can. Don't over-water! 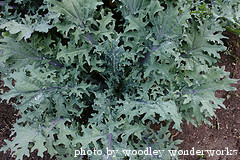 Kale plants don't do well if they sit in soggy soil for extended periods. The idea is to keep the first few inches of soil evenly moist. If you amend your soil before planting, you probably won't have to add fertilizer unless your soil is nutrient-deficient. Compost works well for mulch and it also slowly adds nutrients to the soil that can be retrieved by the roots of kale plants. If you want to use a commercial chemical product, granular and water-soluble types work well. Pay attention to the 3 number code on the label fertilizer. These three numbers indicate the amount of nitrogen, phosphate and potassium that are contained in that particular fertilizer, respectively. For instance, a 10-10-10 fertilizer contains 10% nitrogen, 10% phosphate and 10% potassium. A 5-10-10 bag would contain 5% percent nitrogen. A 10-5-10 bag would contain 10% nitrogen, 5% phosphate and 10% potassium. For kale, use something that is well-balanced. 10-10-10 works just fine. If using a granular product, apply it as a side dressing. This means scattering the fertilizer down the middle of the row and to the side of the plants. You don't want a granular fertilizer coming in direct contact with the plants because it could burn them. After laying out the fertilizer to the side, water it in well. The nutrients will leech into the soil and be absorbed by the plants. For kale, most granular products are spread at a rate of 1 pound per 100 square feet. You can also apply a water-soluble product, something like Miracle Gro. Just mix it according to the manufacturer's instructions and apply when you would normally be watering kale plants anyway. With water-soluble products, it's fine if the mix gets onto the leaves. 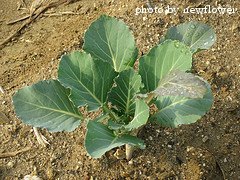 Unless you have an extremely long growing season, kale plants need just 1 dose of fertilizer and it's usually applied after the first leaves are harvested. This gives the plants the boost they need to keep producing. Now that you know about fertilizing and watering kale, it's time to think about harvesting those lovely leaves.